I have been corresponding with Katia Kelly, the blogger in Brooklyn who uncovered Paul Manafort’s fiddle in Carroll Gardens. Not about that; rather about the fate of a church building at 297–299 Carroll Street that burned down mysteriously in the 1970s. Rumour in the neighbourhood had it that the mob did it, the church at that time being in the hands of an Italian Pentecostal group who were letting an outside Hispanic congregation use the building, which was, shall we say, not conducive to good order. Before the Italians, long before Carroll Gardens became Carroll Gardens, this part of Red Hook, or South Brooklyn, was Norwegian. The building on Carroll Street had been Bethelship Norwegian Methodist Episcopal Church, in a period between its primitive foundation in 1857 on a moored hulk, the Bethel Ship John Wesley, and the eventual move of the congregation to Bay Ridge, following the general drift of Norwegians in Brooklyn. I remember the building in question, because over a considerable period of time Salem Gospel Tabernacle ran a mission there, the Carroll Street Mission, an obscure undertaking whose salient feature, from the standpoint of our gang, was the Christmas entertainment for the ‘boys,’ at which we were expected to reprise our Sunday-school Christmas-programme recitation pieces and generally represent the fruits of a settled life to these left-behind seamen—drunks, the mentally ill, anarchic misfits, or the merely womanless. They got coffee and a pastry and a pair of socks along with much exhortation in sing-song chapel-folk Norwegian, and, I fear, very little amusement. A photograph of the interior of 297-299 Carroll Street survives. The delegated worthies who ran the Carroll Street Mission, plus other regulars, assembled for a group portrait. 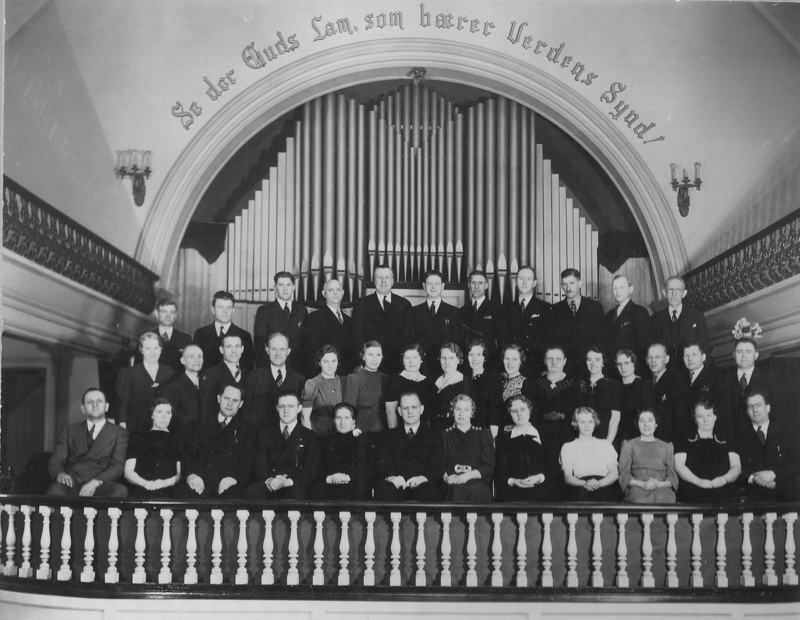 Front and centre the leader, Lauritz Johansen, one of three who held the apostolic office of elder at Salem, a man of monumental stolidity, who not only never spoke but who, to my recollection, never moved his lips, and was said himself to have been saved from drink. His wife Lilly and elder daughter Miriam were beautiful and moved with extraordinary feminine grace, while the younger daughter Ingrid, who was my age, was skinny, and given to snitching on us. I discover from the treasure-store of the 1940 manuscript census, available on line, that Lauritz was a sailmaker by profession, a detail that has a Biblical cast and opens unexpected vistas on the man. The world of derelict Norwegian sailors, the ‘boys’ of Carroll Street Mission, human beach-wrack from a world-wide ocean-going proletariat washed up in Brooklyn, leaves little trace and less interest in gentrified Red Hook, Cobble Hill, Carroll Gardens. Norwegians themselves have not forgotten, however. There is a fine book, co-authored by another sometime correspondent, Roger Kvarsvik, on the depression-era shanty town on the waterfront called Ørkenen Sur—the sour desert—and also a documentary film with stunning footage available at the Norwegian state broadcasting company site. These both require Norwegian, which is not that difficult to learn, and afterwards one may read Ibsen and Hamsun in the original.